Home for Kuntry Kustom RV Auction Trailers and Truck Toppers for Sale Factory Direct. Standard and Custom Models Available. KUNTRY KUSTOM RV HOME / The home for Kuntry Kustom RV started in Shipshewana, Indiana. Founded in 2003 by industry veterans, Kuntry Kustom RV focuses on offering professional auctioneers the absolute best value in auction clerking trailers and auction truck toppers. With the same original owner and founder guiding the company, Kuntry Kustom RV has experienced a large growth in the amount and diversity of trailers being built each year. Along with this growth in production, the company has undertaken a large expansion in the model variety of auction trailers and auction truck toppers offered for sale factory direct. The additional growth in sales made it possible to a move from the original production location in Shipshewana, Indiana to an upgraded and larger facility in Topeka, Indiana. Kuntry Kustom RV has ample space and an expanded modern production line with the ability to build more products. The new home for Kuntry Kustom RV meets the specific needs of professional auctioneers by offering a full production line of auction trailers and auction truck toppers in a wide range of standard and specialty trailer floor plans. Every Kuntry Kustom RV auction trailer and auction truck topper is built to provide a professional, secure, and organized work area to improve an auctioneer’s comfort and productivity. Along with providing a secure and safe environment for auction business transactions, a clerking trailer can be completely climate controlled. The auctioneer can work in comfort year round by adding roof mounted air conditioning and a gas forced air heater (both thermostat controlled) on either the auction truck topper or the auction cashier trailer, . Over the years, Kuntry Kustom RV has worked closely with professional auctioneers to develop and refine the product line. Kuntry Kustom RV takes great pride in producing professional auction equipment that enhances our customer’s professional image and efficiency. Kuntry Kustom RV is committed to building quality products that auctioneers use to achieve success in their business. 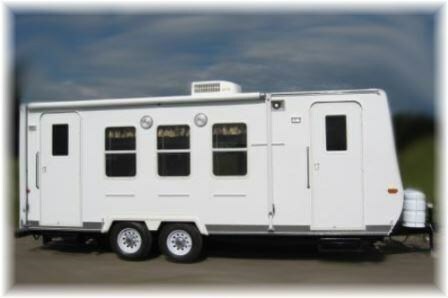 Auction trailers are built from the small 12′ to the large 40′ goose neck trailer. Clerking trailers have walk-up exterior cashier windows or interior walk-in cashier windows. See several standard auction trailer floor plans and available features. Auctioneers can customize there trailer by choosing from a large selection of efficiency and comfort options for their auction trailer. Auction truck toppers are offered with full slide in floors and flat fronts models or cab over models. Auctioneers choose their window style and key features such as cab over for the truck topper. Additionally the truck toppers are offered with tie down options. Customers benefit and get a great value by buying their auction trailer or auction truck topper factory direct from Kuntry Kustom RV. Kuntry Kustom RV designs and builds specialty trailers and offers them for sale. 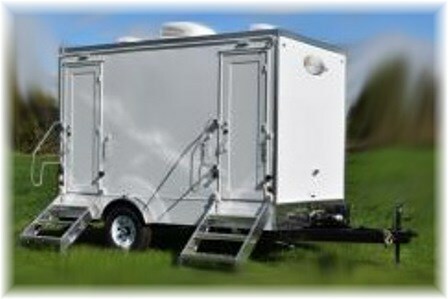 Models include restroom trailers, shower trailers, and combo trailers with both restroom and shower facilities combined. 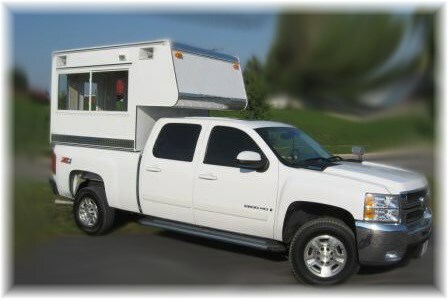 In addition to auction trailers and specialty trailers, Kuntry Kustom RV builds and offers for sale a wide range of specialized goose neck and fifth wheel trailers in designer floor plans. Contact Kuntry Kustom RV home to receive more information on Auction Trailers or Auction Toppers.